Using the subway to explore a new city? Or maybe you’re taking the bus while your car is in the shop? Even if it’s your first time on public transportation, you can ride in total confidence: the Google Now service on your smartphone can alert you the bus or train you're riding on has reached your stop. You’ll see the new alarm feature associated with saved locations in Google Now, like your home and work. 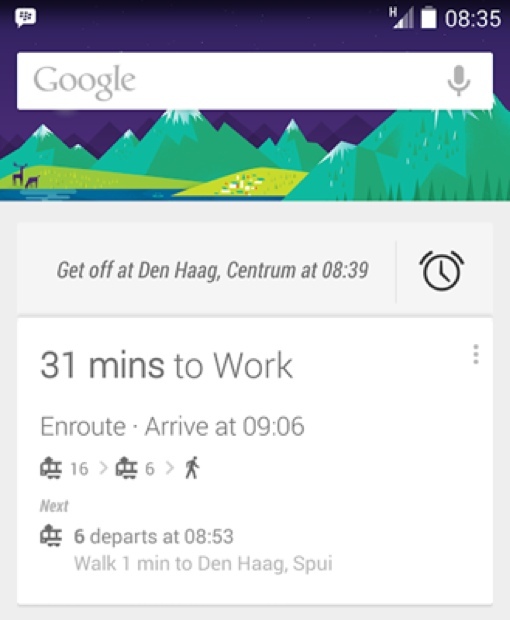 Just tap the alarm when you’re riding the bus or train, and Google Now will alert you at the stop closest to your destination and let you know what time you should expect to disembark. Since Google Now is able to automatically scour your Gmail account for hotel reservations and the like, these new public transportation alerts can be incredibly useful when traveling, especially in countries where the English language is not as prevalent. Just have a copy of your hotel and flight reservations sent to a Gmail account, and Google Now will automatically serve you with real-time public transportation maps and schedule cards when you arrive. Happy and safe travels!